Get style, sophistication and great service at the intersection of Sunshine and Hwy 65! Audi Springfield is your premier destination for luxury cars, accessories andauto repair in Springfield, Missouri! Our patrons don't just come to us for cars - they come to us because they know they can expect excellent customer service. As your local Audi dealer in Springfield, we're committed to helping you find the right caror SUV for your needs and we've recruited top talent who will always treat you with courtesy, honesty and respect when assisting you with your vehicle search. They're also experts when it comes to new Audi cars so they can answer any questions you have about features, powertrains, vehicle specsand other topics. Visit our Audi dealership in Springfield soon to see the new Audi A3, A4, A5, Q3, Q7, R8 and other hot models. Every vehicle in our 2019 Audi lineup combines sumptuous luxury, sophisticated technology and sport-tuned performance, so if you're in the market for a premium car that's got looks, brains and attitude - look no further. We have a fantastic collection of new Audi cars in Springfield for you to peruse and low APR financing is available to qualified buyers and lessees. For pre-owned car shoppers, our Springfield Audi dealership offers luxury on a budget. We have a great selection of used Audi cars that offer all the style, fun-to-drive personality and high-end features you desire at a cut-rate price. The same models we touted above you can get in previous model-year editions for a lower rate, including Certified Pre-Owned models that have passed Audi's 300-point inspection and offer lengthy warranty coverage. Visit our Audidealership in Springfield to browse inventory and hop in the driver's seat for a test drive or two - or three! Along with sales, we have an auto repair shop for customers who would like to utilize a service facility with Audi-trained technicians. After your purchase or even if you don't purchase with us, you'll have access to mechanics who have years of experience and training. Shoppers who buy new or used Audi cars in Springfield will be especially well-served by the skilled mechanics at our shop, because they know all the ins and outs of Audi cars. Plus, our team uses OEM parts! Hundreds have made us their go-to Audi dealer in Springfield, Missouri, for sales, service, parts, accessories and a great dealership experience! We're proud to have earned the trust of our local community and take our role as a business leader very seriously. We're unwavering in our commitment to provide the best possible customer service and products, and our daily goal is to make sure our customers are happy when they walk out the door. 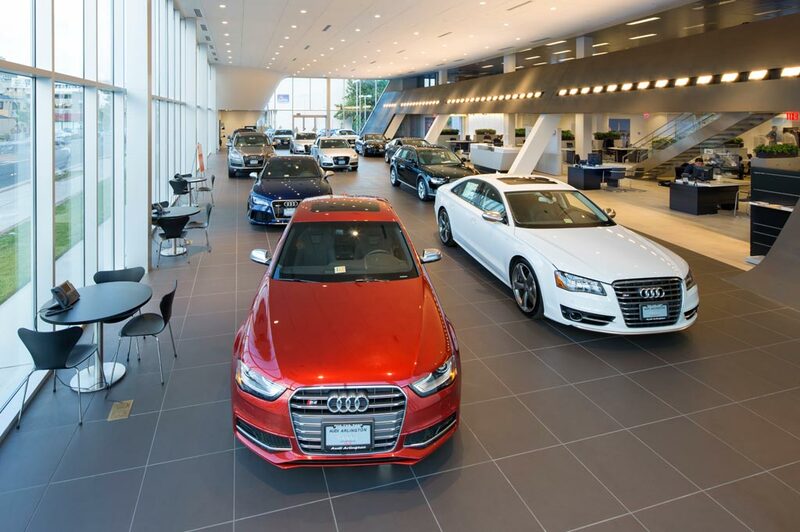 If you've been searching for luxury car dealers near me, stop by our Springfield Audi dealership soon to experience luxury taken to new heights.